Serene Goddess of compassion and mercy, Quan Yin. 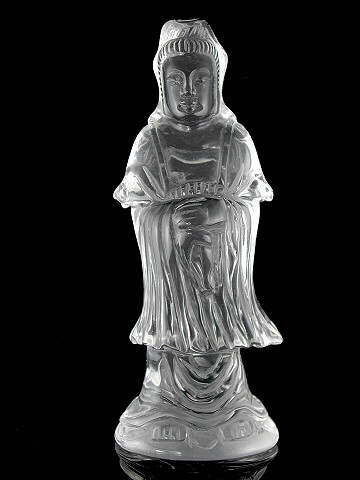 This delightful and expertly carved large statue (5 inches tall), although made of clear glass, would grace any home with her beauty and composure. Quan Yin is an enlightened being whose name means 'she who hears prayers', and it is believed that she answers all prayers invoked in her name. She represents the feminine principle in the Buddhist belief system and as such complements Buddha's Yang energy. She is the protector of women and children, and aids feminine beauty and grace, gentleness, compassion, kindness and benevolence. We placed her on one of our LED light boxes and the effect was quite dramatic. It enhanced her already ethereal appearence to tremendous effect, so we decided to include one with her for free!